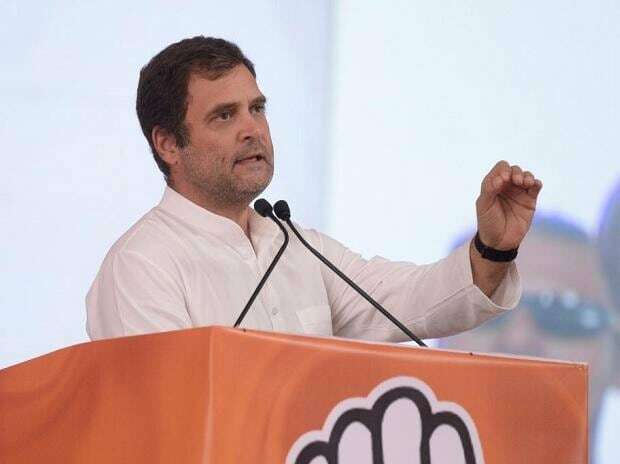 Kicking off the Congress' election campaign in Telangana for the Lok Sabha polls, Rahul Gandhi Saturday said his party would implement a minimum income guarantee scheme for the poor if it is voted to power. He alleged that Prime Minister Narendra Modi was into "making two Indias" - one where "only the rich are benefited and the other in which farmers who seek loan waiver with folded hands are let down". The Congress would not let this happen, Gandhi said. "We have decided that the Congress party will give guaranteed minimum income to every poor person in India. After the 2019 polls, the (Congress-led) Government of India will fix minimum income. It will not be below any of the income levels (below poverty line)," he said. Asserting that not a single person would be left behind, the Congress president said, "We will deposit money into accounts of those whose earnings are less than the minimum income." "People will get money under the scheme if their income is less than the minimum income (fixed), irrespective of whoever they are, whichever state they live in or religion they practice and whatever language they speak," he said while addressing a meeting of Congress functionaries in Shamshabad on the city outskirts. Alleging that some businessmen fled the country after taking hefty loans from banks, but no action has been taken, Gandhi said, "Modi works for 15 people." "Nothing can be done about demonetisation which has hurt people badly, but GST would be simplified once the Congress comes to power," he said, adding the doors of banks would be opened to small businessmen and traders. The Congress would also support farmers in whatever way it can, Gandhi said and asserted that his party would ensure the passage of women's reservation bill. Continuing with his attack on the prime minister, he said, "Modi talks about about patriotism but spreads hatred." Referring to the Doklam issue, the Congress president alleged, "On one hand the Chinese army entered Doklam and on the other, this patriot (Modi) was sipping tea with the Chinese president." The Congress does not bend before anybody and two prime ministers from the party lost their lives for the cause of the nation, he said. "The time has come to remove Narendra Modi (from power). All workers of the Congress should visit every house in Telangana and tell them that the state's chief minister wants to help Modi whose aim is to suppress the voice of India. The Congress can safeguard the voice of India and the Constitution," Gandhi said. The Congress president claimed that the MPs of Telangana Chief Minister K Chandrasekhar Rao-led Telangana Rashtra Samithi supported the NDA government at the Centre on various issues. "Every day we stand up and ask questions about Modi's corrupt deals. I ask how many times did KCR raised his voice. Did the chief minister ever say that there should be a probe into the Rafael deal? This is because he wants Narendra Modi to continue as prime minister," Gandhi said.